is a 6.5 acre island located on the Chain O' Lakes near Waupaca, Wisconsin. Since 1908, the Brigade has offered camps at Onaway Island as an extension of the Building Leaders program at our building in Neenah. Today, camps are available June-August for boys and girls who have completed grades 4-12 the previous school year. Signing up is easy! Sign up online by clicking the registration link in the each section below. Payments will be made through this process to either include the $40 registration pledge per camper, or to make a payment in full. Send remaining pledge balances to the Boys' & Girls' Brigade, PO Box 665, Neenah, WI 54957-0665. Camp registration closes when each camp reaches capacity OR one week before each camp departs. Week-long Camps: Depending on available funding, scholarships for week-long camps listed above may be available to those with financial need. Week-end Anchor Camps: Depending on available funding, scholarships for week-long camps listed above may be available to those with financial need. LTC combines the education of a conference with the fun and excitement of a summer camp. LTC is a blend of empowering speakers, unique leaders, team building and free-time activities. Available to youth who complete grades 10-12 in spring 2019. Boys’ Camp 2 provides youth in grades 6-11 with exciting activities and new adventures year after year. Through a mix of healthy competition, structured activities and free-time activities, campers grow mentally, physically, socially, and religiously. Girls’ Camp 1 provides youth in grades 5-11 with exciting activities and new adventures year after year. Through a mix of healthy competition, structured activities and free-time activities, campers grow mentally, physically, socially, and religiously. 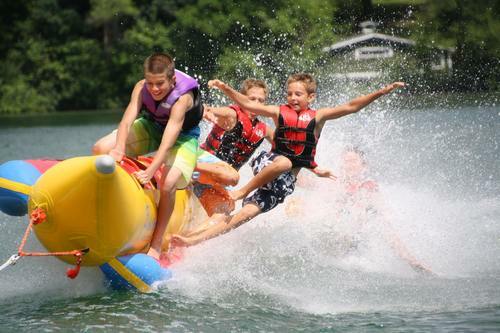 Four day, three night retreat at Onaway for family and friends enjoying all of the island's activities including swimming, tubing, waterskiing, canoeing, kayaking, games, crafts and more! Boys’ Camp 3 provides youth in grades 6-11 with exciting activities and new adventures year after year. Through a mix of healthy competition, structured activities and free-time activities, campers grow mentally, physically, socially, and religiously. Girls’ Camp 2 provides youth in grades 6-11 with exciting activities and new adventures year after year. Through a mix of healthy competition, structured activities and free-time activities, campers grow mentally, physically, socially, and religiously. Boys’ Camp 4 provides youth in grades 6-11 with exciting activities and new adventures year after year. Through a mix of healthy competition, structured activities and free-time activities, campers grow mentally, physically, socially, and religiously. Girls’ Camp 3 provides youth in grades 6-11 with exciting activities and new adventures year after year. Through a mix of healthy competition, structured activities and free-time activities, campers grow mentally, physically, socially, and religiously. Girls’ Camp 4 provides youth in grades 6-11 with exciting activities and new adventures year after year. Through a mix of healthy competition, structured activities and free-time activities, campers grow mentally, physically, socially, and religiously. OAC is a co-ed wilderness camping experience for 5th-11th graders. All campers experience canoeing, kayaking, trail hiking, and biking, while older campers have opportunities for rock climbing, backpacking, and whitewater kayaking. Led by experienced leaders, OAC allows youth to try new hobbies with gear provided by the Brigade. Campers spend the first half of the week experiencing the wilderness at Hartman Creek State Park, and the second half of the week experiencing the traditions at Camp Onaway. Anchor Camps are for youth who have just completed 5th grade to introduce them to the magic of Onaway Island. They'll experience many of the activities that take place at a week long camp, including reveille, flag raising, morning dip, free time activities (including swimming, tubing, banana boat, kayaking, crafts, topside games, tribal games, cross-country race), chapel, campfire and taps to end the day. Experienced 8th-11th grade campers act as cabin leaders to help familiarize the 5th graders to life at camp. The 2019 Girls' Anchor Camp is a three day, two night camping experience. Anchor Camps are for youth who have just completed 5th grade to introduce them to the magic of Onaway Island. They'll experience many of the activities that take place at a week long camp, including reveille, flag raising, morning dip, free time activities (including swimming, tubing, banana boat, kayaking, crafts, topside games, tribal games, cross-country race), chapel, campfire and taps to end the day. Experienced 8th-11th grade campers act as cabin leaders to help familiarize the 5th graders to life at camp. The 2019 Boys' Anchor Camp is a four day, three night camping experience. Youth who completed 4th or 5th grade in the spring of 2018 can explore the island, swim, go tubing, & more! This summer we are offering a girls' day camp, a boys' day camp and a co-ed day camp at Onaway, as well as a co-ed day camp at Hartman Creek State Park. This is an opportunity for youth ages 9-14 to have fun at Onaway Island with a parent or guardian. Contact the Brigade office if you want to get on the wait list for a full camp.